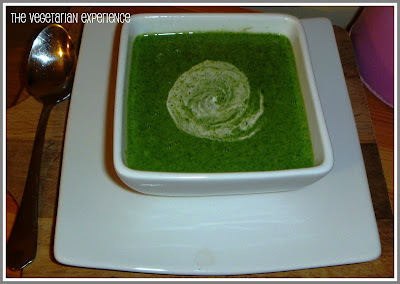 The Vegetarian Experience: Vegetarian Easter Starters - Spinach, Rocket & Watercress Soup & some other ideas! 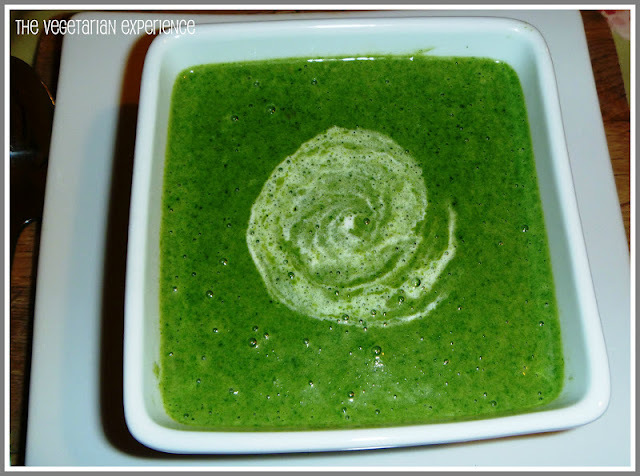 Vegetarian Easter Starters - Spinach, Rocket & Watercress Soup & some other ideas! Well here we are in Easter week 2012, and most people are now starting to gear up for the Easter Weekend. With a four day weekend in the UK, Easter is a great time for visiting family and friends or hosting family and friends and of course food typically features on the agenda - and I don't just mean chocolate! If you are hosting Easter you may be finalising your Easter menus this week, or you may have planned your Easter menu weeks ago and are now happily sitting back munching on Easter Eggs! Clarify whether they eat foods like Parmesan, Pesto or other cheeses which can contain animal rennet. Clarify whether they eat Gelatine - if they don't then many cakes and desserts will be out. Clarify whether they want a dish which complement the meat eater's dish or whether they would like something completely separate. Clarify whether they mind their food being cooked in the same oven as meat - some vegetarians don't. Think about your fats, sauces and gravy's. Are they vegetarian? Have you used goose fat in the roast potatoes? Do you only have meat gravy rather than vegetarian gravy also? All of these things are important to many vegetarians. If the meat-eating members of the family are having a roast, most vegetarians I know would still want to share the trimmings of the roast with the meat-eater's and so would appreciate a dish which complements the vegetables, roast potatoes and accompaniments being served rather than being served something like pasta or rice whilst the rest of the family tucks into a roast. When cooking for vegetarians at Easter, think about using seasonal ingredients. Using seasonal ingredients at Easter is always a great idea as they will be readily available and may even be on offer. They will also typically be ripe, and will taste delicious. Vegetables in season in April are Asparagus, Beans, Leeks, Watercress, Rocket, Spinach and Spring Onions. So those are some ideas for vegetarian starters, but what will I be making as a Starter for our Easter Dinner this year? Well whilst leafing through the Morrisons magazine this week, I came across a recipe for Watercress and Spinach Soup and thought that it would make a fantastic starter for my Vegetarian Easter menu. As we are having a Vegetarian roast, I think that soup is always a great starter pre-roast as it is quite light. At the supermarket I found a mixed bag of spinach, watercress and rocket on offer. All three salad leaves are in season and so I decided to include them all in my soup and make a Rocket, Watercress and Spinach Soup. The thing that most attracted me to the soup is the colour - the intense green colour is very bright and spring like and it looks very healthy and full of flavour. The soup looks lovely when served and it tastes absolutely delicious. The flavour of the leaves really comes through and the cream, potato and leek base of the soup helps to give it a rich creamy texture, although it doesn't taste overly heavy. The soup is super easy to make and can be made in advance and chilled or frozen. This soup definitely makes a great addition to any Easter dinner table! Here is my version of Spinach, Watercress & Rocket Soup. Don't forget to check back tomorrow for some Vegetarian Easter main-course ideas! Heat the olive oil in a pan over a medium heat and add the leek, potatoes and cumin seeds once the oil is warm. Cook the mixture until the leeks are softened but not browned. Boil the kettle and make the vegetable stock if you have not done so already. Add the vegetable stock to the pan, stir well and bring the mixture to the boil. Then reduce the heat and gently simmer the contents of the pan for around ten minutes. Stir well and season to taste. Place all of the watercress, spinach and rocket into the pan and stir to combine. Cover the pan and cook the leaves for about a minute - until the leaves have wilted but have not lost their colour. Remove from the heat and stir. Add the single cream to the pan and blend the mixture in a food processer or by using a stick-blender until the mixture is smooth. Serve immediately and swirl with some cream to decorate and serve. Or allow to cool and store in the refrigerator or freezer. Notes: Reheat gradually so that the cream does not split. 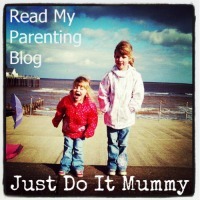 Fab Thanks so much for featuring me!